This hooded cowl scarf was so fun and easy to make. I love knitting in the round and somehow it seems so much easier. I also love the fact that when I knit in the round there are no seams when I'm finished. That's what makes this a nice quick knitting project. If you are new to circular knitting this pattern is great for you to start with. In fact it doesn't get any easier than this. And the nice thing about this pattern is that you can use any kind of yarn to make it. I'll show you how. This is just an example. 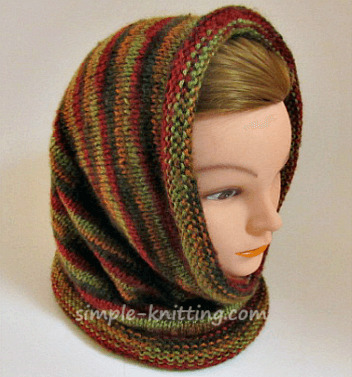 The pattern for my hooded cowl is below. It's very simple. First you need to know how many stitches per inch you have so you need to knit a gauge swatch. Let's say your swatch reads 3 stitches per inch. Measure your head or the head of the person you're making the hooded cowl for and let's pretend the measurement is 20 inches. Now that will work however you might want to consider 'ease' which simply means that you need to give a little extra room in your garment or in this case the hood. All you need to do is add a couple of extra inches (or more if you want it really loose) to the head measurement. 20 inches (head measurement) + 2 inch = 22 inches X 3 sts per inch = 66 sts to cast on. The same rules apply if you want to use a thinner yarn as well. If you'd like to download this knitting pattern please click here. NOTES: Here's a little knitting tip and what I like to do before joining my work in the round. As you may know it's really important to make sure that none of the stitches are twisted around the needle. If they are you will have to rip your knitting out. And I've done it. So I like to knit flat for a couple of rows before I join my work. That way it's easier to see if my work is twisted or not. When I knitted this hooded cowl I knit 4 rows of Garter stitch flat. You could of course knit Stockinette stitch (knit one row, purl one row) if you wish. It doesn't matter. Then I joined my work. Cast on 92 stitches and don't join. When you finish the 4 rows, straighten out your knitting and make sure your stitches aren't twisted around the needle. Join work and place a marker at the beginning of your work so that you know where your round begins. Knit around and around for at least 20 inches ending with 4 rows of Garter stitch just like in the beginning. Bind off very loosely. Seam those 4 rows of garter stitch you did before joining your work, weave in ends.